The company founder has completed several business administration courses. Darcy educated herself in botanicals and their uses while raising her family. Before having her first child, Darcy graduated from The Bryman School, specializing in medical assistance and receptionist responsibilities, such as billing, order-entry, and customer relations. These bookkeeping experiences were later applied with a CPA firm where she worked part time during tax season. In addition she used these skills as a secretary for S&S Steel, including payroll and collections. Darcy also developed her own house cleaning business that contracted with general contractors for final clean up of new homes. She had a crew of four girls. Darcy was one of the founders of The Sespe Natural foods coop where she set up the membership guidelines, wrote the monthly newsletter, and gained more knowledge of healing herbs, as well as organic foods. She conducted several fundraisers for the coop and as head of the membership committee, built up a membership of 500. From 1984-2003, Darcy augmented her skills by created another business as a concessionaire. Her business ‘Fruit ‘N Stuff’, was an organic smoothie business that traveled to fairs and music festivals. Where she managed as many as 15 employees, until she retired and sold the business. Tierra Sol Farm, was founded 1993. A small, family farm, developed for sustainability by, growing organic vegetables and fruits. Produce was grown for family, friends and the local food bank. Since the development of Hemp-EaZe™ Therapy cream, the farm has expanded a 1000 sq. foot plot to maintain the organically growing herb garden. As a new entrepreneur starting out, I tried to tackle all the business tasks by myself in developing Hemp-EaZe™ product and design. Learning the computer and all it’s diversities, I taught myself through ‘hunt and peck’ to design the labels and brochures for the business. It was a daunting task, and I was quite limited with my inabilities. As years went by, even with experimentation and gaining computer experience, Hemp-EaZe™ labels printed off my printer, where quite primitive and basic. Then a miracle happened, an angel appeared. Not in the Biblical sense, but I was rescued. In 2010 I was contacted by Shelley Furgason, A graphics designer. ( www.shelleyfur.com. ) She said she’d been reading my posts and saw I had a worthy product needing an expert’s touch to bring our product up to a professional style. She said, “I am a freelance designer with over 20 years experience in advertising graphics. I design magazine ads, posters, brochures, internet ads and much more for clients ranging from high-end jewelers to luxury realtors. I’ve been the Lead Advertising Designer for an Educational Publisher and the Art Director for a Drag Racing Series. I have extensive experience promoting business’ large and small. Shelley said to me, “I will redesign all this stuff for you! IT will be unlike anything you expect, professional, clean and memorable to new and existing customers. You need way more color and type design that speaks to the real impact your product can make. My creative juices are flowing! In a few days, I will show you what I have in mind. ”The results were beyond my imagination. So beautiful, so alive, so professional! 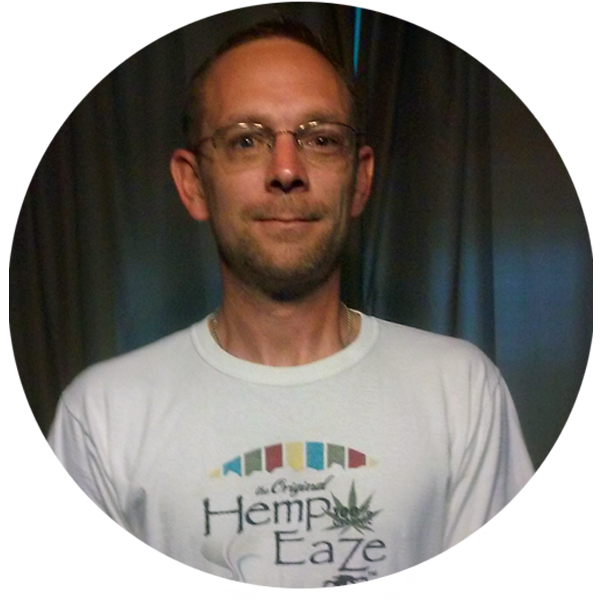 The past almost eight years Shelley Furgason has developed our Hemp-EaZe™ Website, Logos, Labels, Posters, Ads, Our Facebook page, Brochures and Business Cards. She single-handedly has taken Hemp-EaZe™ out of the dark ages and into the light! I am blessed to have Shelley Furgason on my staff and our association has developed into a true friendship! If you ever need any help with creative design, I would highly recommend contacting Shelley Furgason! As a world traveler, a musician, a mother, and a Glider Pilot, Carol has graced the company with creative new ideas to help move us forward. In 2009, Shirley and I with our 3 Children (at the time), met Darcy and Bill on our Tour for Compassion Bicycle Tour. They are true grass roots hero’s, they helped us with our tour and awakened us to the knowledge concerning the uses of the “Roots” of the Cannabis/Hemp plant. Something they kept focused on, while the rest of the activists in the U.S were focusing on the rest of the plant. Their dedication to keep their focus on the Root and its uses, brought the birth of Hemp-EaZe products and an avenue to Naturally relieve pain and suffering. We as a family from everyone 18 months old to 60, has used and still continue using Hemp EaZe to treat many different encounters in life, with amazing results. From severe sun burns from hundreds of miles of bicycling, diaper rash, insect bites and stings, chapped lips, severe tissue damage healed without surgery, with Those kind of results.. It Grabs attention!! We continue to carry the Hemp Eaze name and products on our bicycle tours. Sharing with everyone Darcy’s and Bill’s dedication, focus, and knowledge of their product to Everyone.